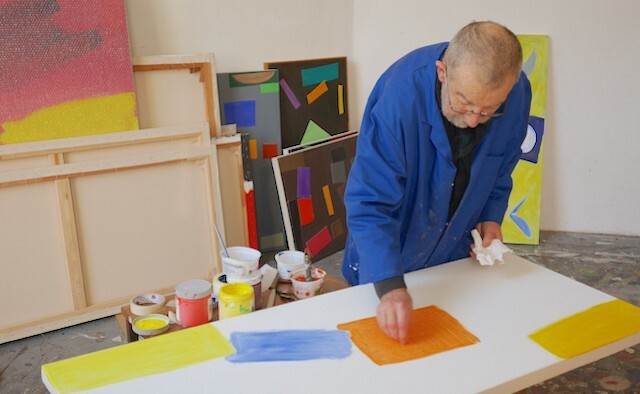 A documentary about the Scottish artist John McLean – who was diagnosed with Parkinson’s in 2014 – will be screened at the Barbican Centre, London, UK, this weekend. The 78-minute film, ‘Which Way Up’, follows McLean as he creates his art, shedding light on the decision-making process governing the abstract shapes and colours that are prevalent in his work. John McLean, who has displayed his paintings at some of the world’s most prestigious galleries including the Tate, UK, and the Scottish National Gallery, UK, and the Yale Centre for British Art, US, has described how his Parkinson’s has exposed him to new artistic techniques. Earlier in the year, McLean was among a group of artists, which included Sarah Lucas, Damien Hirst and Grayson Perry, who were invited to display their work in the Cure3 Exhibition, a fundraiser organised by The Cure Parkinson’s Trust.